Met by local staff at international airport and transfer to Grand Hotel Deluxe room. 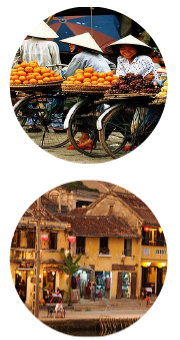 Take a stroll through the streets of Saigon and soak up the bustling atmosphere of this exciting & cosmopolitan city. In the evening, enjoy a dinner at a local restaurant. After breakfast, transfer to Long Thanh Golf Club – Lake course. 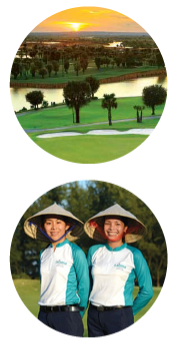 The Long Thanh Golf Club has been constructed on a plateau, offering superb panoramic views in every direction. Perhaps the most spectacular view is looking due west, across the Dong Nai River, over the rice paddy fields and seeing the tall buildings of Saigon in the distance. 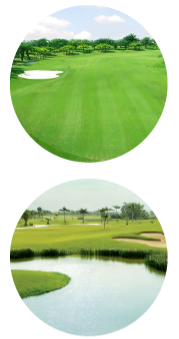 Fairways are lined with beautiful oil palm trees and other similar species, the emphasis being on evergreen in order to keep the course in pristine condition throughout the year. Large undulating greens, with many bunkers and water hazards to catch errant shots combine to make Long Thanh Golf Club one of Saigon’s best golfing experiences. After golf transfer back to hotel. The 18-hole Korean owned course was developed by Ron Fream’s Golfplan Company from the USA and is located on an island on the Saigon River. The out and back layout is typical of top resort courses. Heavy bunkering on most holes of this otherwise flattish land adds interest and enjoyment throughout the golf course and poses challenges even for the most serious golfers. After golf transfer back to your hotel. Take an optional city tour to explore Saigon or visit the Cu Chi Tunnels or a speed boat down the Saigon River to the Mekong Delta. After golf, transfer to Saigon airport for a short domestic flight to Danang. Upon arrival at Danang, you will be greeeted by local staff and transfer to the Novotel Danang Premier Han River – Superior room for check-in. After breakfast, transfer to the Montgomerie Links Vietnam, Colin Montgomerie’s only Asian creation. The site has an amazing beachscape, which makes the perfect palette for this links style course. Moving boldly over wispy Casuarina pines and sand dunes the Montgomerie Links Vietnam gives you the feeling of being in Scotland without the cold temperatures you find in the British Isles! In addition to an excellent golf course, there is also a large contemporary club house where you can relax after golf and take in the spectacular views of nearby Marble Mountain. After breakfast, a one hour drive to the Laguna Lang Co Golf Club, which is located between the ancient city of Hue to the north and Danang to the south. Designed by Sir Nick Faldo, the Laguna Lang Co Golf Club is an 18 holes championship golf course which takes advantage of the variety of existing environments with golf weaving between trees, over rice paddy fields and streams, through impressive rock features and alongside the beach. A truly memorable golf experience. After golf, transfer back to your hotel. Reminiscent of both Scottish links golf and Melbourne’s sand-belt region, Australia's Great White Shark Greg Norman has created arguably Vietnam’s best golf course. 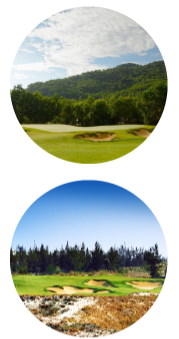 Built on the sandy loam soil of China Beach, fairways are generous and there is restrained use of water. More so than other areas of Vietnam, the wind can be a major factor on the central coast. After golf transfer back to your hotel to freshen up before a farewell dinner at a local restaurant. After breakfast, check out of your hotel and spend a few hours exploring Danang or Hoi An. Last chance for those souvenirs or gifts before transfer to Danang International Airport and flights back to Australia. One of the oldest hotels In Saigon, it opened in 1930 and was completely restored in 1997. Nestled in Saigon's scenic riverside area and within walking distance to major commercial and entertainment precincts, the hotel still retains its French colonial style, provides a perfect base for a completely relaxing vacation. Inside this French colonial style hotel, you will find 230 luxurious guestrooms and suites with panoramic views of Saigon River and HCMC, recreation area, VIP Lounge, Western & Asian restaurants, Rooftop Grand Cafe, Bars & Spa, etc, as well as friendly and professional staff. Our proud tradition of hospitality is evident in every detail, making your stay at the Grand Hotel an engaging and memorable experience. Uniquely located in Danang downtown on the beautifully designed Western Bank of the Han River, Novotel Danang Premier Han River take its place as the a premier hotel venue for both business and leisure travellers. The hotel offers breathtaking views of the city and Danang Beach. The 37-storey hotel features 323 rooms with 3 executive floors, extensive meeting facilities, outstanding fitness and spa facilities, engaging yoga classes, international restaurants and bars. The hotel offers unrivaled panoramic view of the city’s beautifully-illuminated bridges, the surrounding mountains and endless beaches. Like many cities in Vietnam, Saigon has an interesting past. Because of its strategic location for trade and commerce, Saigon continued to grow and became a city by the late 1700’s. In the mid-19th century, the French invaded the Saigon port city. This event led to long struggle between the people of Vietnam and France leading to the defeat of the French in 1954. By the 1960's and 1970's, Saigon was bustling with commerce and business. It was the cultural centre and the capital city of South Vietnam. The city had an air of a French provincial town with a Vietnamese twist, and this still remains today. In 1976, after the fall of South Vietnam, the new government renamed the city Ho Chi Minh City. However, the city is still referred to as Saigon by the locals. With a population of over 5 million people, Saigon is one of the densest urban areas in the world. Unlike other cities in Vietnam, Saigon is very active at night. Sidewalk cafes dot the city, pubs and restaurants stay open late into the night, and entertainment options for visiting Saigon golfers are a plenty. Hoi An & Danang are connected to each other by modern coastal road and together make up the Vietnam’s Golf Coast. Vietnam's recognition as an up-an-coming golf destination is no secret, but the Vietnam Golf Coast ups the ante even further. Hoi An, with its lovely wooden shop-homes was set up in the 16th century. It has been revived in the 20th century to commemorate the long history of Vietnamese international trade. Wandering through its protected old town, visitors are transported back to the 16th century when Hoi An was Vietnam’s most important trading port. For those looking for a glimpse of the real Vietnam, or just a fun night out, Hoi An mixes old world charm with a modern and vibrant night life. Enjoy an interesting tour to Cu Chi tunnels, through urbanized areas and a typically lush southern Vietnamese countryside. The tunnel complex was dug in 1948 for the guerrillas to hide from French air and ground sweeps. It also served as communication routes and food and weapon caches as well as hospitals and living quarters for guerrilla fighters throughout the American war. Visit the underground villages to better understand the tunnels’ history, life in the tunnels and the Vietnamese’s resilience during the combats. Should I bring my own golf clubs? Weighing both the pros and cons of bringing your own golf clubs to Asia, our advice is that if your trip is mainly for golf, you will be happier using your own full set of clubs. You will feel more comfortable, confident and not have to get used to anything new or of less quality. How do I ensure the safety of my golf equipment during travel, especially during transit? In the case where golfing in Asia is your main holiday objective, you most likely would have booked your golf holiday through a specialized golf tour operator such as Golfasian who is well equipped to properly handle and secure golf equipment and has already factored in baggage transfers into your package. Other essentials to take on your golfing travel to Asia aside from the standard equipment? In addition to your golf clubs there are the 7 essential items to bring when golfing in Asia. The tropical sun is much stronger than in the west, especially in winter, and too many a visitor has suffered severe sunburn after playing only one round in Asia. This is easily avoidable if you bring light colour clothing to deflect the sun, Sun block (the highest SPF available), and a golf cap or hat. A rain cover is an excellent idea as you never know when an Asia downpour will occur. The good thing is any rain, even during the middle of the rainy season, will cool things off and is unlikely to stop your round for too long. Of value may be a small first aid kit for blisters, insect bites, or scratches. Perhaps the most important thing to remember about going to an Asia golf course, and in fact any golf course, is a good attitude. This is rarely included in a "must bring" list, but I find if you make a conscious effort to be positive, that you are much more likely to score well, thus ensuring a good time on the links and a memorable golfing holiday in Asia. Most of the golf courses in Asia accept credit cards for purchases in the pro shop such as caps, balls and gloves. However, sometimes they're systems can go down and in any case all Asia golf courses require cash for caddies, so make sure you have a good supply of local currency for any purchases or caddy tips. Around AUD 20 per round is acceptable. Bring an umbrella, not just for the rain but to give you shade from the sun. As strange as this seems, a golf umbrella can lower on course temperatures by more than 5 degrees and make the difference between being dehydrated and exhausted from the heat before you even finish your round, to actually making for pleasant playing conditions. Finally you should always bring the usual items any properly prepared golfer has including spare gloves, a towel or two (particularly useful for wiping sweat from yourself and your grips). Should I stock up on golf balls or buy them on my travels? Most Asian golf courses have many water hazards and it is not uncommon for even good golfers to loose several golf balls during their round. Stock up on your favourite golf balls and think of it as a “donation” to the local area. Any custom or immigration requirements that the travelling golfer must be aware of when travelling to the Asian region? To enter Vietnam, you must have a valid visa, a visa exemption document or a written approval letter for a visa on arrival. Your passport must also have at least six months’ remaining validity at the time of your arrival. Is it better to hold national currency like the Dong or US dollars when golfing abroad? Travellers should change money on arrival to pay for incidentals, gratuities, and small items at stores that do not accept credit cards. All major airports have money changing kiosks, banks, and ATM machines where local currency can be purchased at competitive rates. Playing on Vietnamese golf courses, what are the dos and don'ts? Asia has no doubt become one of the leading destinations in the world for visiting golfers. Here are a few special golf tips that if well understood will ensure that you have an excellent time on the courses in Vietnam. Golf in Asia may be a bit different to what you are used to, and certain aspects of etiquette should be considered. You must remember that you are in a country that has completely different culture and customs, and you should adapt to this as a visitor. The cultural style in Vietnam is certainly more relaxed when organizing or arranging things. While this can lead to some frustration, it is inpolite to show this, and certainly will not lead to any great assistance. A simple smile and show of courtesy goes a very long way on the golf course. When playing golf in Asia remember you are a visitor, and respect the locals who are also playing. Golf is still quite a new sport in Vietnam and some locals may not be as familiar with the etiquette that we have been taught. Caddies are a unique feature of golf in Asia, and predominantly female, they perform a great task in very tiring conditions. Always be polite and courteous to your caddy, and you are sure to get a great service. Although the language can be a problem, there are ways to get around this. Tips are greatly appreciated by the caddies and I recommend around AUD 20 or more if you are pleased with her service. The refreshment and drink stops that are located every 3 or 4 holes are a great concept in Asia. When you stop for a break, remember to ensure that you do not fall behind the group in front. By maintaining your group in relation to the players in front will avoid any unnecessary confrontation on the course with other groups behind. For visitors that have played golf in Asia before, you will be certainly be aware that there are many water hazards on the courses. Often these 'lakes' are frequented by young males with the purpose of finding your ball should you hit an errant tee shot. If you should be in this situation, a small tip of AUD 1 is expected by the 'crocodile', should he manage to retrieve your ball. Any other advice for golfers? Everybody should be playing golf for fun and enjoyment, and although golf can provide us with many frustrations, by keeping a cool head you will get far more out of the game and ensure you have a great time golfing in Asia. I hope that this information is useful to you.